About half a decade ago this website not only rejuvenated my dormant love for progressive rock but it also introduced bands unknown to me that were courageously carrying the prog banner proudly despite a total snubbing of their craft by the popular and effete media. One of the first groups that caught my eye (due to their high ranking) was Marillion but when I finally got and absorbed their heralded debut, 'Script for a Jester's Tear,' the album's amateurish drumming was, frankly, a turn-off. However, I didn't give up on them and I'm glad I didn't. 'Fugazi' (mainly due to Ian Mosley taking over on the tubs) was an improvement but both 'Misplaced Childhood' and 'Clutching at Straws' were 5-star records that knocked me completely out. I knew that if I went forward in their discography that I'd have to deal with Fish, their charismatic singer who played a major part in making those two albums extraordinary, being long gone and I therefore resisted collecting more of the band's catalogue due to fear that it would be a let down so I explored other groups instead. Recently I came into possession of 'Brave' and decided it was time at last to hear how the band had fared after the big man went solo. 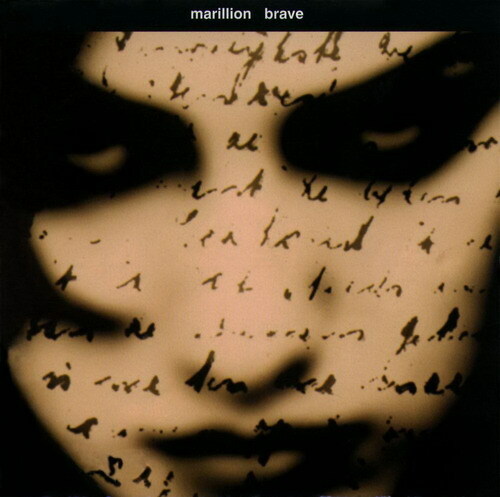 Seven years and two albums after Fish's departure seemed a long enough span for Marillion to have redefined themselves so I spun this disc from '94 with an unbiased, open mind. I suspected that, since four core members were still intact, they hadn't foolishly disowned nor abandoned their prog upbringing so the real test was whether or not Steve Hogarth could hold a candle to his predecessor. The ominous opening to 'Bridge' gives the impression of approaching doom but then Mark Kelly's beautiful keyboards enter and all is well with the world. On 'Living With the Big Lie' I got my first taste of Steve's voice and his initial soft approach reassured me that they hadn't gone wildly radical when choosing a new front man. The band constructs a delicate background before Ian Mosley's drums burst in to make damn sure that I know without a doubt that it is, indeed, the mighty Marillion I'm listening to whether I miss Fish or not. Steve Rothery's guitar work is suitably menacing and it was good to hear that the group still paid attention to the crucial importance of a song's dynamics. Being a concept album I expected the lyric content to be vital and, while I consider the record's 'teen-in-trouble' premise to be anything but novel, I do find randomly scattered lines like 'The beauty of your mothers eyes/the pain when you fall/you drink it in and marvel at it all/but you never really figure it out/you get used to it,' above average. 'Runaway' is next and its subtle intro leads you into a very dramatic atmosphere that ebbs and flows. I appreciate the dense depth of field they erect behind Hogarth but the tune lacks that magic moment that could've pushed it over the top. Things get better on 'Goodbye to All That.' It's a more complex number that presents several intriguing musical aspects to be pondered. I'm particularly impressed with the excellent blend of keyboards, synths and guitars. The number's drifting, ethereal movement is wholly satisfying and they show true patience in letting the song build up gradually before dissolving to just vocal and piano and then climaxing with a grand finale. 'Hard as Love' is a bullish rocker fueled by Ian's punchy drums and an aggressive, almost Spinal Tap-ish countenance. The weak verses and chorus aren't that memorable and the latter going gets a little too frantic for my tastes but the lovely bridge section saves the track from overkill by providing a few seconds of needed perspective. I detect a heavy Peter Gabriel influence running through 'The Hollow Man' yet in this case it's a positive tint. I especially like that they kept the tune's arrangement simple and didn't try to make it more than what it is. A strong rock beat drives the beginning of 'Lap of Luxury' confidently but the slick Phil Collins vibe that Steve's singing drenches it with so dominates the tune's personality that it becomes too familiar in a negative way. The 2nd half of the song is a predictable, noisy descending chord pattern with a lot of fierce guitar riffs but I do like how it eventually levels out into a dream-like coda. 'Paper Lies' is another straight-ahead steamroller that causes me to ask aloud, 'Whatever happened to their penchant for odd time signatures?' The tune's best moments come when they veer from the formula crossover mindset and let their collective imagination steer things in more engaging directions. A cosmic segue takes you into 'Brave' and the remainder of the record is well worth the up and down journey involved in getting to this point. An extended drone precedes Hogarth's penetrating vocal, preparing you for a song that transcends the norm. He delivers his best singing performance thus far; bolstered by the fact that here he doesn't remind me of anyone else at all. The track evolves gracefully, transporting me upward into a higher, hypnotic stratosphere and it reminds me of what I adored about this group. 'The Great Escape' is large-scale, towering symphonic prog rock that's deliciously cavernous and captivatingly massive. This is what I can't get from any other genre and when I hear it I relish it with fervor. My hat's off to Steve here because his voice meets with aplomb the challenge this demanding kind of material presents. It's the apex of the album due in no small part to its melodic structure and the exciting peaks and valleys they tightly traverse with ease. Rothery's Spanish guitar gives the closer, 'Made Again,' a fluid opening that I didn't anticipate. It's a pretty tune with a quiet, pensive aura and the words imply that the female protagonist has somehow gone to heaven or achieved enlightenment. 'Like a bright new morning/like a bright new day/I woke up from a deep sleep/I woke up from a bad dream/to a brand new morning/to a brand new day/like the whole world has been made again,' Hogarth croons. A crisp 12-string guitar then enters and takes over, filling up the spaces as the group expertly adds layer upon layer of rich sounds to fasten a classy ending on the project. While 'Brave' didn't change how I feel about their Fish-era instances of brilliance that thrill me to this day, I will confirm my deeply-felt relief that Marillion proved themselves quite capable of maintaining their poise during the difficult post-Fish transition and reestablishing themselves as viable and worthy 21st century representatives of the progressive traditions they'd so valiantly upheld during the dark ages of the 80s and early 90s when prog was considered an out-dated pariah. Their dogged persistence has been an inspiration to proggers all over the planet and they deserve recognition accordingly. Plainly, 'Brave' is a fine record. Three and a half stars.